The IB Learner Profile is the “heart” of IB. Through the IB program, students will develop and internalize these attributes. Teachers connect them to the curriculum, discuss their meaning, and provide students with feedback on how they are developing each attribute. As a school, we also focus on one attribute each month and recognize one another for exhibiting the attribute through our Role Model Moments recognition program. The attributes of the Learner Profile are Inquirer, knowledgeable, thinker, communicator, principled, open-minded, caring, risk-taker, balanced, and reflective on the IB website. There are 5 essential elements of the PYP. These elements work together to help students become globally-minded learners who exhibit the IB Learner Profile attributes. What do we want students to know about? The PYP curriculum units are organized under six globally significant themes. Multiple subject areas may be taught in one unit under the same theme. This helps students gain a rich understanding of these big ideas and see connections between subjects. Through units of inquiry, students learn about these concepts. 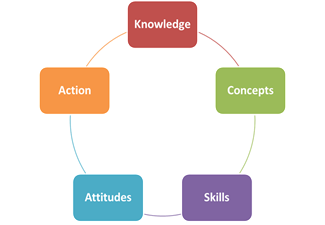 Learning conceptually helps students think at high levels and apply their knowledge to new situations. The key concepts are form, function, causation, change, connection, perspective, responsibility, and reflection. In order to access knowledge, students need to develop skills that will help them both in- and outside of school. Skills are taught in authentic ways through throughout the program. What do we want students to feel, value, and demonstrate? The attitudes are the PYP “building blocks” for the IB Learner Profile attributes. Teachers incorporate these into their classrooms and provide students with feedback. The attitudes are appreciation, commitment, confidence, cooperation, creativity, curiosity, empathy, enthusiasm, independence, integrity, respect, and tolerance. IB believes that education must extend beyond the intellectual to include not only socially responsible attitudes but also thoughtful and appropriate action. We encourage students to take action based on what they are learning. As a PYP school, we embrace inquiry-based learning. In Inquiry-based classrooms, students are active participants in constructing their knowledge.